Thousands of children are being taught in unregistered schools across England, many more than previously thought, Ofsted's chief inspector has said. Sir Michael Wilshaw said a crackdown had found more than 100 suspected illegal schools - half of which were faith-based, Ofsted said. Roughly a third of them were Islamic and a sixth either Christian or Jewish. 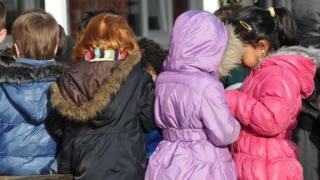 Seven warning notices have been issued to schools in London, Wolverhampton, Birmingham, Luton and Staffordshire. Unregistered schools are those that operate outside the supervision of the Department for Education, local authorities or Ofsted inspections. They are often run by faith groups and there are concerns about the safety of pupils in their charge. In a letter to Education Secretary Nicky Morgan, Sir Michael said his team of seven experienced inspectors, working closely with DfE officials, had identified more than 100 suspected unregistered schools across the country since January. "The evidence they have gathered so far during this short period firmly reinforces my belief that there are many more children hidden away from the view of the authorities in unregistered schools across the country than previously thought," he said. In the past month alone, seven unregistered schools with more than 400 children had been identified, Sir Michael told BBC Radio 4's PM programme. He said his inspectors found schools operating in warehouses and old factory buildings, and the establishments were "often charging parents for the privilege". He said the children were in "very serious danger" and not just from the "filthy" premises, with open drains running through some of them. "If the people in these institutions are not carefully vetted and they are not, then the wrong sort of people could be looking after these children," he said. "And they could be associating with people who have extremist views." Sir Michael added: "These children are not being educated well, the curriculum is being narrowed, often only religion being taught, homophobic literature being found." These schools were using the freedom of parents to home educate their children as a cover for their activities, he said. "I think the rules around home education need to be tightened," he said. "There is a correlation between the growth of home education and the number of illegal schools that are now operating." He called on local authorities, who he emphasised "are charged with the responsibility of safeguarding all children whether they go to a local authority school or academy or free school", to show vigilance and share intelligence. Many of these schools are charging parents thousands of pounds, Sir Michael said. Talking about the religious schools in particular, he said parents were sending their children because they were not satisfied with mainstream education "because music, for example, could be taught or creative subjects which they disapprove of". "And some religious leaders are encouraging their parents to do this - some leaders in the Muslim community and the Jewish community are doing it". A Department for Education spokesman said nothing was more important than keeping children safe, adding that councils have clear powers to take action where there are concerns. "We have given new resources to Ofsted to investigate unregistered schools and to prepare case files for prosecution by the CPS. "We have consulted on new measures to protect children in out of school settings offering intensive education. We received a large number of responses, which we are now considering, and will make a further announcement in due course." Shadow education secretary Lucy Powell accused the government of being "asleep at the wheel" and allowing extremely worrying and potentially dangerous practices to evolve in the schools system. "The Tories' education policy has led to a fragmented schools system lacking robust local oversight to spot and tackle serious problems early on. "As a result, many children are dropping off the radar or ending up in illegal, unregistered schools for months or years, where they are at risk of being exposed to harm, exploitation, or the influence of extremist ideologies." A spokesman for children's charity NSPCC said: "When picking these institutions, some parents might not know that such 'schools' are unregistered and employees haven't had the proper background checks or safeguarding training and are unaware of the risks these pose to their children. "It's vital that every individual who works with children passes these checks to help keep every child safe." Update: This report contains new information from Ofsted, which had previously said most of the schools involved were Islamic or Jewish.